Water your garden without the garden hose damaging your plants by using these Achla Ball End Hose Guides. Adding hose guides to your yard provides a way to direct your garden hose, keeping it from running over and ruining delicate plants. These six guides are perfect for routing quite some length of hose, the 2.25" diameter spiral at the top of each holding the hose in place with ease. 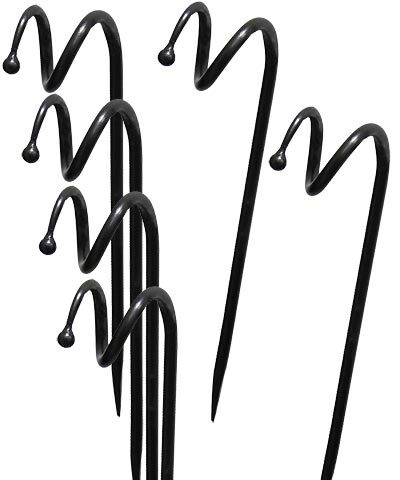 A small orb completes each spiral, for a fun look, and a pointed end on each guide stakes into soil easily. Made from lasting, wrought iron, each unit will remain durable and usable for many seasons, and the gray, powder coated finish provides protection from rusting. Keep your landscaping looking lovely, even during watering, with these Ball End Hose Guides. Note: This case pack includes 6 of the Achla Ball End Hose Guides.